Google Analytics 360 customers that use DoubleClick Campaign Manager (DCM) can take advantage of a native integration and link the two products together, bringing DCM data directly into your Google Analytics reports. Access your View-Through and Click-Through metrics within your Acquisition reporting and gain better insight into how your DCM traffic compares with other traffic channels. Excited yet? Keep reading! DCM stands for DoubleClick Campaign Manager and is the central hub for advertisers to serve display ads and manage campaigns (publishers, check out the DFP integration). DCM is where you can perform media planning, manage creatives, target ads and run reporting (though it is not where you buy inventory). DCM was formerly called DoubleClick for Advertisers (DFA) which was replaced with this new, robust platform. You can think of DCM as the super-charged option compared to running display ads through AdWords and the Google Display Network (GDN, another acronym!) since trafficking can involve non-Google networks and ads can be placed directly on specific sites. Beyond the popular leaderboards and rectangles, it includes cross-device, video, rich media and YouTube ViewThru formats in addition to the typical static display and creative sizes. Who Will Benefit from DCM? DCM is optimized for enterprise-level organizations like large Ecommerce sites, travel sites and banks as just a few examples. Small to mid-size businesses will likely use AdWords to run display campaigns. If you have both DCM and Google Analytics 360, there’s no reason not to integrate. Once the decision is made, contact your Google Partner to start the process since it involves e-mailing permissions and Google engineers enabling the link on their end. Media cost data does not have to be included with the integration, so make sure to ask your DCM manager if they would like those metrics to be shared with Google Analytics. Typically different teams are viewing each platform, so it’s a good idea to check. *Watch out! This can be confusing if you are using a shared DCM account. If that is the case, use the parent Advertiser ID. You’ll work with your Google Partner to help get the link established between DCM and GA.
As you’re setting up this integration, make sure that the Google Analytics or Google Tag Manager settings are ready to go as well. In Google Analytics, navigate to Admin >> Property >> Tracking Info >> Data Collection. The toggle for Advertising Reporting Features needs to be turned on after reviewing Google’s related policy as well as your organization’s own privacy policies. If you are tracking through Google Tag Manager, you can find this setting in your Pageview tag under More Settings >> Advertising. Once the link is active, you’ll be able to see it under Admin >> Property >> DoubleClick Digital Marketing >> DoubleClick Campaign Manager Linking. This is also where you will have to choose which views you would like to see the data in. If no views are checked, the reports will be blank so don’t skip this step. Why Don’t the Metrics Match? When I mention mismatched metrics like sessions, transactions and conversions, I’m not just referring to the discrepancies between the DCM platform and Google Analytics. I’m referring to comparing the Source/Medium report to the DoubleClick Campaign Manager report in Google Analytics under the same property. This doesn’t mean that the integration is broken or that you are doing anything wrong with DCM or Google Analytics. It’s important to know that these are two different tracking programs and they work and behave using two different models. The DCM model lives in its own bubble and really only cares about itself – all traffic that isn’t DCM will be ignored. 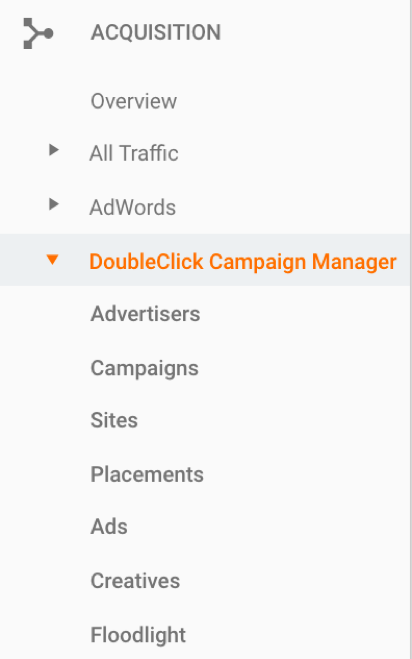 So in Google Analytics, this model is used only in the DoubleClick Campaign Manager reports section. The usual GA attribution can be expected in the regular reports, which is why the numbers will be so different. Let’s take an example – if a user ever saw or clicked a DCM ad at any point then visited your site, it will be counted in the DCM model. So if I see and click an ad somewhere, then eventually search for something and click on your site’s organic link, then in my DCM reports, it will count as a DCM session and another Click-through. This model makes sense here because the integration metrics come directly from DoubleClick Campaign manager. DCM is all about how many eyeballs saw your ad so the model will be about impressions and clicks regardless of other traffic sources in other sessions. This is similar to how AdWords reports don’t exactly match your GA reports. What DCM Reports are Available in Google Analytics? Having these reports available lets you tie ad trafficking activity to your web behavior and thus your users’ experience. 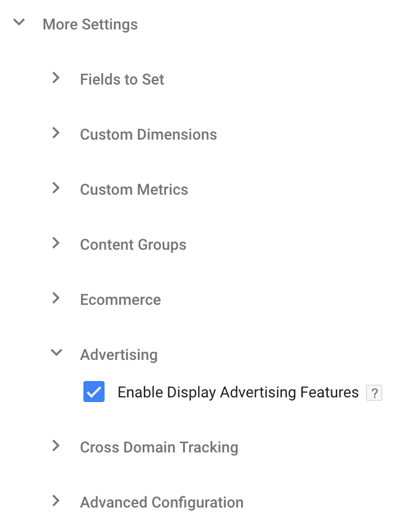 You will see a new menu option when you go to the reporting tab in the Google Analytics 360 interface under Acquisition >> DoubleClick Campaign Manager. In addition to these specialized reports, DCM traffic will also show up in Google Analytics reports that you may already be familiar with. This section refers to the main All Traffic reports under Acquisition in Google Analytics. DCM traffic will show up as dfa/cpm which is a throwback to the DoubleClick for Advertisers days. It uses the usual Google Analytics model rather than the DCM model for sessions, conversions and transactions. If your data looks different and you do not see ‘dfa’, check out this information on UTM overrides. Use this report when you want to see sessions that are directly from your DCM ads and when you want to see conversions where DCM was the most recent session. TIP: Switch to the ‘Floodlight’ tab in the Explorer to see the DCM Conversions and DCM Revenue metrics with Source/Medium. The dfa source and cpm medium will be grouped into the ‘Display’ channel by default, so you can see that data in the Channels and Treemaps reports as well. To analyze DCM as it relates to multi-session journeys, check out the Conversions >> Multi-Channel Funnel Reports and the Attribution >> Model Comparison Tool reports. Above the reports you can switch from All to DCM to see DCM paths by advertiser, site, campaign and placement. Now we’re getting even more value by combining DoubleClick Campaign Manager data with Data-Driven Attribution! DCM and DCM with the Google Analytics Model are available to use as secondary dimensions in the standard reports as well as in custom reports. These dimensions are around advertiser, site, placement, Floodlight IDs and activities, as well as creatives and ads. I’ll note that the DCM (still referred to as DFA) metrics are not included in the Google Analytics BigQuery tables, unlike DFP. They are also not funneled into the Data Studio Google Analytics data source, however a new DCM data connector was recently released. The DoubleClick Campaign Manager and Google Analytics 360 integration provides the opportunity to analyze DCM campaign performance alongside your Google Analytics data. The integration does not cost extra above the cost of Google Analytics 360, so existing customers can get started by contacting their Google Analytics Certified Partner. Enterprise organizations using the free version of Google Analytics will not be able to use these reports inside of Google Analytics without upgrading to the Google Analytics 360. Being able to see richer display data allows you to analyze engagement, weight attribution and have insight into how it relates to the micro-conversions you may have set-up as Google Analytics goals. It also provides an opportunity for collaboration and transparency if your organization works with a media team using DCM separate from your web and analytics team using Google Analytics.